– It was in the cave of Hira that the prophet Muhammad received the first revelation of the Quran. For rugby’s original wild child Sonny Bill Williams, meeting a Tunisian family who lived with their five children in a one-bedroom flat in the south of France proved pivotal to his conversion to Islam. The New Zealander’s unshakeable belief in the Almighty has proved to be the making of one of the island nation’s most gifted — and controversial — sports stars. “I was real close with them, and I saw how happy and content they were. 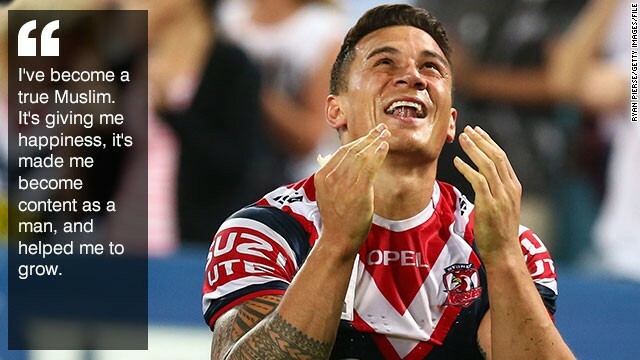 And to see how they lived their lives, it was just simple,” Sonny Bill Williams, a prodigious rugby talent, professional boxer and tattooed poster boy, tells CNN’s Human to Hero series. This weekend Williams will continue his bid to become the first player to win the World Cup in both union and league, as the Kiwis take on Australia in the final. His mere presence in the squad caused a storm, as he only made himself available the day after it was named — reversing his earlier decision. It meant one unlucky player had to make way. “I thought I was doing a good thing, you know, staying true to myself,” says the 28-year-old, who had just completed a triumphant return to Australia’s National Rugby League competition, winning his second title and subsequently deciding to extend what had initially been planned as a one-year stint with the Sydney Roosters club. “Then obviously there was a bit of a falling out, because one of the players was taken out of the squad, one of the young boys, and I just got absolutely hammered. “And it just made me think, you can’t please everyone, you know? If you go about trying to please everyone, there’s going to be endless struggles. “My toughest opponent is probably myself, I guess, mentally,” Williams says in his quiet voice, a gentle contrast to his powerful physique. Stripped to his trunks in the boxing ring, you can see the rippling muscles and elaborate tattoos that have made him a pinup. “Overcoming the mental struggles that you have out on the field, it’s been probably the biggest one for me. The reason I feel so mentally strong now is because of boxing and going through those tough times,” he adds. Williams is close friends with fellow Muslim Anthony Mundine, a former Australian rugby league star who became a boxing champion and has helped the Kiwi fulfill his ring ambitions. 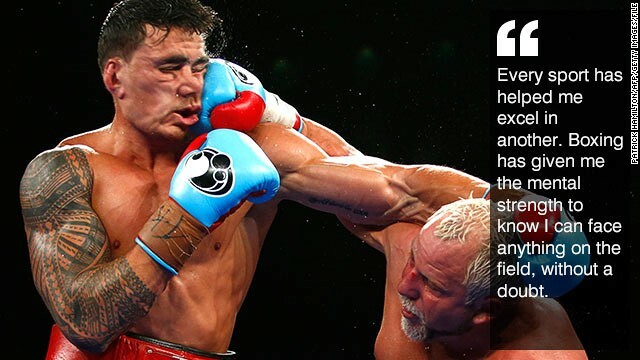 Williams’ last fight, back in February, earned him the little-known WBA International Heavyweight title — and some punishing blows from South African journeyman Francois Botha in a reduced 10-round bout. “Every sport has helped me excel in another. Boxing has given me the mental strength to know that I can face anything on the field, without a doubt,” he reflects. That sixth fight is likely to be his last for a while, as he focuses on his rugby goals. Rugby is a de facto religion in New Zealand, a country where the gods play with an oval ball and where institutionalized faith is losing ground with its general populace — just over 50% said they were Christian at the last completed census. He is back playing the sport that is perhaps closest to his heart — his dad played it, and his mum’s father was a renowned coach in Auckland, New Zealand’s largest city, where he grew up. Family means everything to him. His parents are separated, but he brought his father to Sydney with him and sees his mum when he can. He has bought both of them houses. He’s always been competitive — even if it meant finding a short cut to finally beat his older brother (“the biggest influence on my sporting career”) in their regular childhood running races — and he had been pegged as a future athletics champion before choosing rugby league. Williams became the youngest player to be signed by an NRL team, winning his first Grand Final as an 18-year-old with the Canterbury Bulldogs in 2004, and was the youngest to represent New Zealand’s Kiwis league side. “I grew up as a Christian, like many Polynesians do, and moving to Australia suddenly when I was 15, I learned a lot about Muslim faith,” he says. It was in Toulon where, having fled Australia under threats of lawsuits from his jilted employer, his conversion to Islam was realized. Having to adhere to the rule of Ramadan fasting has given him a new perspective on some of the things we take for granted. “When you do Ramadan and you go for the whole month, you’re that much more appreciative of being able to eat food and drink water — that’s what it’s designed to do,” he says. But faith in the divine can only do so much, he says — the rest is up to you. “To be the best you definitely have to have some God-given talents, but you also have to have the drive and the will and the dedication,” Williams explains. Having switched allegiances so often, Williams finds himself having to work hard to earn acceptance — which means trying to break some of his own habits. “I’d like to be a bit more trusting, letting my guard down a little bit more. I’m too serious sometimes, bro, as you can tell,” he acknowledges, before breaking into a big grin. Williams admits he would be tempted to try another of rugby’s formats, Sevens, which will make its Olympic debut at Rio 2016. “That would be a dream come true. If I had the opportunity to give it a crack, I definitely would,” he says. Whatever he decides to do after his new Roosters deal ends next year — he has hinted he will return to union ahead of the 2015 World Cup — it’s a fair bet that Williams will succeed. He has won titles almost everywhere he has been, and that has been driven by something deep inside him. “I just don’t want to fail, to be honest. I don’t want to let my family down, I don’t want to let myself down,” Williams admits, falling back into his earnest, serious tone.